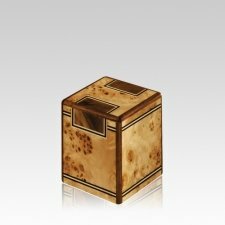 The Riviera Small Wood Cremation Urn is made from a blond maple burl with walnut burl and ebony inlays. The smaller size makes this urn perfect for families that are scattering or sharing the cremains. This is truly a beautiful urn. A sophisticated and wonderful way to memorialize your loved one.